is included with your Conch Tour Train Ticket. 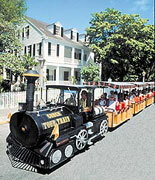 See the Best of Key West on the tour that's been entertaining visitors to the Island City since 1958. The Conch Tour Train is one of Florida's most popular attractions, and for good reason. The expert engineers, and friendly staff have delighted over 10 million guests with the legends and lore of this charming tropical paradise. Henry Flagler's railroad arrived in Key West on September 22, 1912 and the Island City was changed forever. 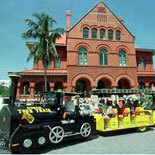 The Conch Tour Train is proud to be the legacy of Flagler's engineering miracle. Join The Conch Tour Train on a 'train ride' through time. Be taken back to the days before civilization when fierce Indians left their enemy's bones to bleach in a tropical wilderness naming the island Bone Key. Explore a lush, tropical island, and discover the charm and grace of one of America's most unique architectural pleasures. Get to know characters like John James Audubon, Ernest Hemingway, and Harry S. Truman and, like them, become captivated by the magic that is Key West. From bold Spanish explorers and brave 'Wreckers' to the great cigar barons and sponge magnets... The Conch Tour Train will transport you from the golden age of settlement through the exciting railroad days, the depression and WWII. There's much to see and learn. Daily from 9:00 am to 4:30 pm 364 days a year. Tours depart approx. every 30 minutes. Fantasy Fest Weekend- Last full tour Fri-Oct 26th at 12:00pm. Closed on Sat Oct 27th and first tour at 10:00am on Sun Oct 28th. A - Front Street Depot: Key West Aquarium, Key West Shipwreck Treasure Museum, Mallory Square Festival Market Place, El Meson De Pepe Restaurant, Key West Memorial Sculpture Garden, Mel Fishers, Audubon House, Harry S. Truman Little White House, Sunset at Mallory Square. B -Truval Village: Hemingway House, Lighthouse Museum, Southernmost Point, Key West Butterfly & Nature Conservatory. C -Conch Tour Train Station: Gift Shop, restrooms, ice cream parlor, Duval Street. D -Flagler Station: Historic Seaport, Yankee Freedom III Dry Tortugas National Park Ferry, Schooner Western Union, Ferry Terminal, shops and restaurants. Conch Train Depot-Mallory Square - 303 Front St., Key West, FL, 33040 Truval Village at the Corner of Truman and Duval St. The Hemingway Rum Company, Papa's Pilar Distillery Guided Tour is located at 201 Simonton Street (corner of Greene & Simonton). Parking is available at Mallory Square or The Margaritaville Parking garage. Parking is also available on the street at meters. This tour makes a stop at Truval Village close to Southernmost Point, Hemingway Museum, The Butterfly Conservatory, The Lighthouse, and the Star of the Sea Grotto. You can get off and board a different train to return. Without an e-Ticket voucher you must go to either the Conch Train Depot or Truval Village location with invoice order number. Conch Tour Train Tickets purchased online can be used any day. Parking is available at Mallory Square or The Westin Parking garage. Assistance animals, such as seeing-eye dogs, are the only animals that are allowed on board the train.